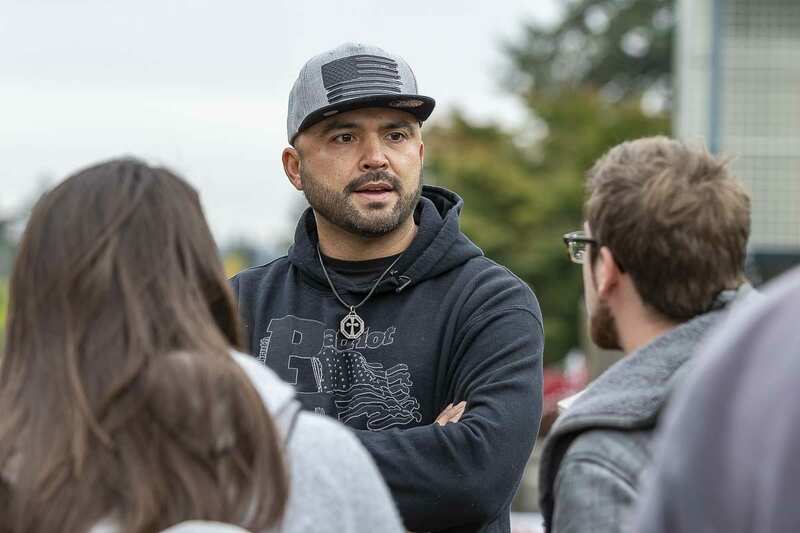 VANCOUVER — The controversial group Patriot Prayer, led by Clark County native Joey Gibson, held a series of rallies this week. On Monday Clark College shut down classes ahead of the group’s first rally there, out of fears over potential violence. The group’s gatherings in downtown Portland have led to national-headline-grabbing brawls with counter protestors, usually identifying as Antifa activists. Despite the concerns, and a few brief shouting matches, Monday’s Patriot Prayer rally was largely peaceful. 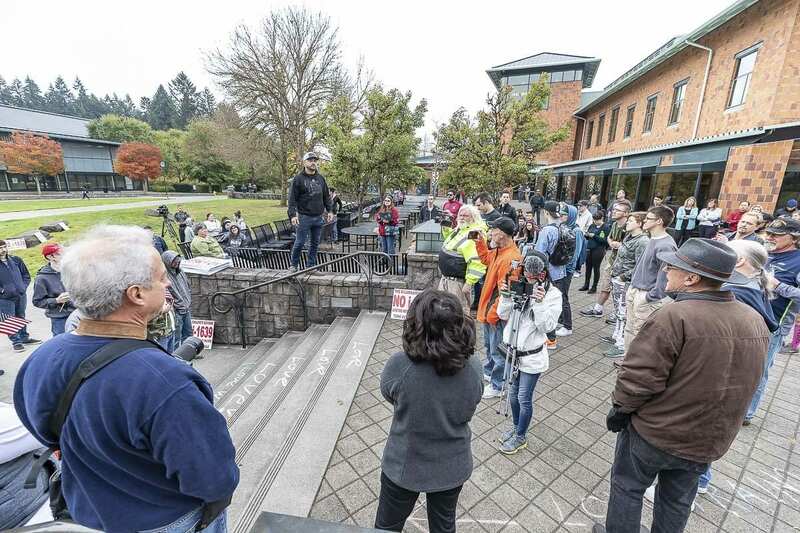 The next day, members of the group came to the WSU Vancouver campus, where dozens of Clark County Sheriff’s vehicles, along with campus security, dotted the hillside above the Firstenburg Family Fountain where students and faculty gathered to hear what Gibson and his group had to say, and engage them in conversation. 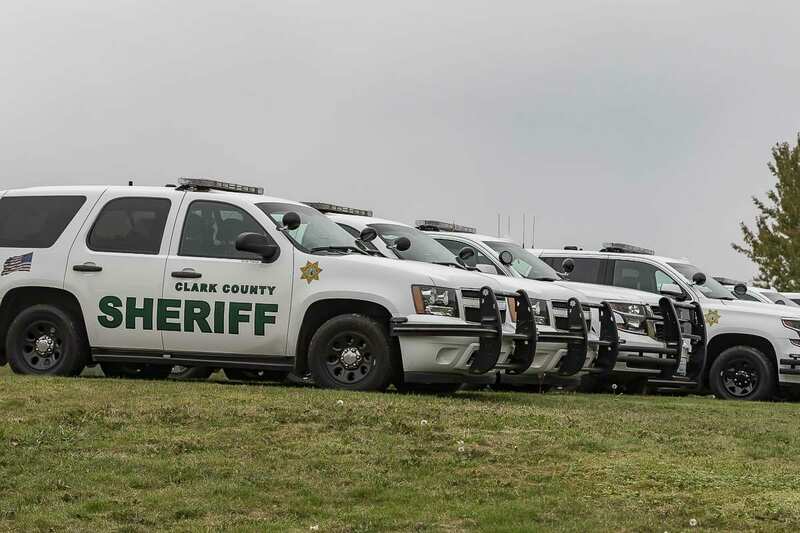 With deputies standing by, the meeting went off peacefully, with only a couple moments of tension that quickly dissipated. One woman held a sign reading “Actions Speak Louder than Words.” She claimed to have been at rallies in downtown Portland, where she said Patriot Prayer member Tusitala “Tiny” Toese, who is an imposing 6’6” Samoan man, had punched a defenseless boy during a rally. The woman, who did not want to be interviewed, was confronted by a member of Gibson’s group, who said she was lying. She denied it before walking away and leaving the campus. While Gibson’s rallies were, on the surface, an attempt to campaign against Initiative 1639, which would impose new regulations on gun ownership in Washington State, they were also apparently an attempt for Patriot Prayer and the Proud Boys to defend themselves in a place where members of the media sometimes seemed to outnumber onlookers. “I’m done with the hate,” Gibson declared at one point, saying that he wanted to, instead, love people like Jesus did. Gibson’s Patriot Prayer has become connected with the Proud Boys, a group that many consider to be a white supremacist organization. At one point, as he took questions from the audience, Gibson was challenged to denounce racism, which he did. But he also defended the Proud Boys as a group that was tired of men being put down, and the United States being belittled in the rest of the world. The Proud Boys are a men-only group, that admits it was formed to fight back against what they see as the emasculation of modern men, and the rise of a female-dominated culture. They also are proudly Nationalist, which President Donald Trump recently said he was in support of. Gibson says he is half Asian, and is hurt by allegations that he is a racist. Toese is black, and from the island of American Samoa, and also denies that Proud Boys and Patriot Prayer are racist organizations. Both men claim that they have welcomed known neo-nazis into their group, but that those men no longer are racists after hearing what they have to say. 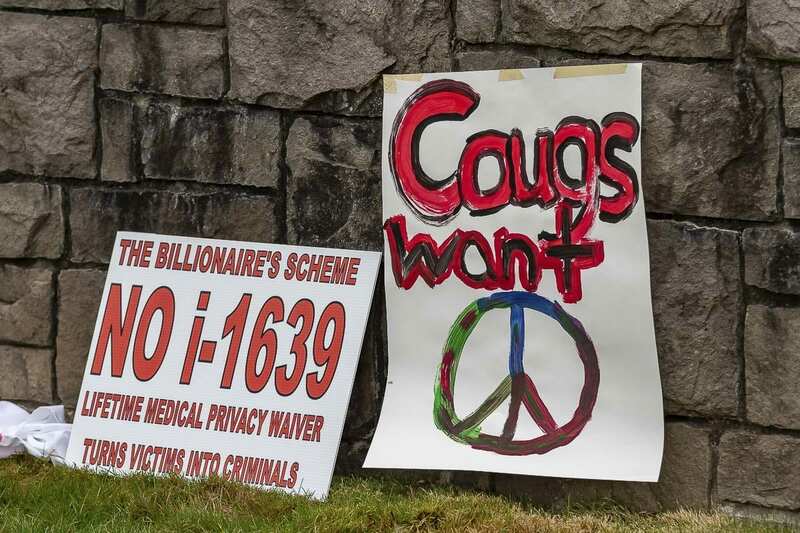 Wednesday at the Clark College campus, things were again relatively peaceful. Near the gathering of Patriot Prayer, a group that dubbed itself “No Hate Just Debate” set up shop. Chris Thobaben, a democrat running for the legislature in the 18th District, along with 17th District candidate Damion Giles, Sr., said they welcomed members of the group in for a discussion. Gibson maintains that he has only wanted to have a conversation, but that the city of Portland and its police department have failed to enforce the laws, leading to confrontations. While Toese admits to having been involved in a number of altercations, he has claimed that it was only in defense of others who were being attacked. At Tuesday’s rally, Gibson said police in Vancouver have done a better job of making their presence felt, in order to prevent any violence. Others at the event commented that it’s more likely many members of Antifa commute by mass transit, and it’s not easy for them to cross from Portland into Vancouver. Some students who came to Tuesday’s rally said they left impressed with the open dialogue Gibson was able to have with the crowd, and even his willingness at one point to admit that he had over-generalized when accusing professors of telling their students his group was racist and violent.